We need to get to the end of ourselves to fully experience God’s power in and through us. Would you agree with this statement? Well, it seems to be one of the things Paul is saying in 1 Corinthians 12 where he defends his apostolic ministry. First he mentions that God caught him up to heaven where he ‘heard inexpressible things, things that man is not permitted to tell’. Then, he continues, God gave him a ‘thorn in his flesh’ to prevent him from becoming conceited. But Paul’s affliction also served another purpose; it kept him dependent on God. 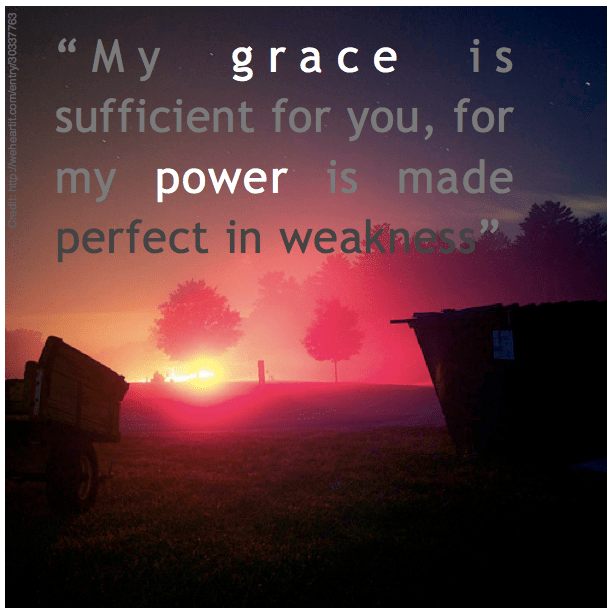 When he asked the Lord to heal his progressive blindness, for that is what I think the ‘thorn’ was (see Galatians 4:13-16 and 6:11), God responded with, “My grace is sufficient for you, for my power is made perfect in weakness”. The first part of this could well mean something like, “Paul, don’t worry what others think of you because my favour and regard is all you need.” However, it is the second part of the statement that I want to zoom in on; “My power is made perfect in weakness”. A loose paraphrase of this could be, “My power only really manifests fully in you when you stop trying to do it all yourself. For me to be strong in you, you need to know that you are weak in yourself.” Now that is a rather strange thought for many of us. Certainly it contradicts the way the business and political world thinks; one of their mottos is ‘the only one you can rely on is yourself’, and there are several others that express the same sentiment. But does God mean that He wants us to do nothing so that He can do it all? I don’t think that is quite it. In the Old Testament, there is the fascinating story of how Jacob wrestled with the angel of the Lord at a place he later called Peniel. Jacob was a tricky fellow who had thrived by using his wit and abilities to excel, largely at the expense of others. He had stolen the rights of a first born son from his brother Esau and now the time had come for him to face up to both himself and his brother. He sent his family and possession on ahead of him to impress and placate his brother in a final attempt to get ahead through guile and strategy. Then he stayed alone all night at a spot where the Jabbok and Jordan rivers meet. The Lord appeared to him in material form and wrestled with him until dawn. Finally, when all of Jacob’s strength and endurance were at an end, the Lord permanently impaired him by throwing his hip out of joint. God then changed the ’victorious’ man’s name to Israel. What usually happens with us, if we are honest with ourselves, is that we try to do everything we can in our own strength and then, like Jacob, we only come to God for help when we have tried everything but are still not succeeding. We seem to have to get to the end of ourselves before we rely on God’s grace and strength. What a pity! Wouldn’t it make so much more sense if we realised up front that we can’t do it on our own and asked the Lord Jesus to partner with us from the very beginning. What a great clip! Thank you. Reading this article again really raises complications. There have been times in the history of the church (and your church in particular) where people have really felt led to put on an event (The Event) or prepare for revival. It is difficult to reconcile a Christian people really wanting to serve Jesus, then acting on His leadership and then … nothing. It looks on the surface that God hasn’t fulfilled his part of the partnership by not manifesting His power and presence. Perhaps God gives general blessing to all his children but then when it comes to the church and His people he needs a process followed to the letter and if anything goes wrong then He withdraws His blessings on the undertaking e.g. Israel doing a census and having thousands killed, hitting the rock too many times, touching the ark of the covenant etc. If this is even half true – regarding corporate blessing – then what makes it even more difficult is that it is very difficult to hear God’s specific direction and too easy to miss. Thanks for your comments Lance. The main point of the article is that if purely in our own strength we try to do what we believe God wants, then we will invariably fail to one degree or another. We need to realize that we represent the lesser part of the partnership between God and us. Unfortunately, we so often don’t realise this and act as though everything depended on us. So, when this happens, we need to get to the end of our own resources before the penny drops and we submit to God’s power and will. Concerning your comment about how we sometimes try to do what we believe God has initiated but nothing seems to come of it – I always try to understand this from the perspective that God is good and able all the time and in all things. Therefore, if there is any failure it is on my part, not God’s. Perhaps I didn’t hear him correctly, or I got the timing wrong, or I simply acted in presumption. God can do anything he wants at any time, but his intent is usually to involve us because his plan is not just to get things done but to develop us.